Always wanted to make a sampler quilt? With our ‘Beachcomber’ block of the month, you will have 32 blocks to choose from, so you never get stuck with a block you don’t absolutely love! Each block is made with Makower fabric. No commitment required, purchase as many or as few you like. Each month a new block will be available, plus optional co-ordinating binding and sashing kit. The difficulty level of each block will vary, so you can challenge yourself as your confidence grows if you want to. Also makes a great gift either made up or in kit form. No rotary cutter required! Pre-cut pieces mean you can get stuck into the sewing immediately. Each block can be completed in as little as an afternoon. It contains all the pre-cut fabric shapes required to make the featured block. Kit includes detailed easy to follow full colour instructions in the form of a pdf which will be emailed to you. Because of the directional nature of one of the fabrics used, your finished block may face one of four ways. Contents: All the Makower pre-cut fabric to make up the featured block. Equipment required: Sewing machine, sharp scissors, ruler, pencil, and tape measure. 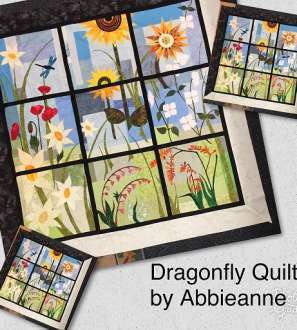 We are a new start-up offering pre-cut quilt kits from beginners to advanced quilters. Our kits contain precise cut fabric shapes, for quilters who love to piece quilt tops, but either don’t like to or are unable to cut out large amounts of fabric. All orders ship from the U.K. In stock products ship within 3 business days. You will be notified of estimated shipping time for all back ordered products. All products are shipped as a minimum of 2nd class and signed for. All unopened and unused products are returnable. Customer must pay return shipping as a minimum of second class and signed for for security.